Ever wonder why Kegel exercises don't seem to help? Incontinence impacts the lives of millions of women. Since 2003 Christine Kent has been helping women successfully manage their pelvic organ prolapse. Below is a trailer for the The Whole Woman Solution to Urinary Incontinence. If you suffer with stress urinary incontinence (SUI) of over-active bladder (OAB), or just want to prevent developing these embarrassing and difficult conditions in the future, you're in the right place. You are about to discover how to stabilize and reverse most forms of urinary incontinence including SUI and OAB without dangerous drugs or surgery. Back in the early 90s, I had a bladder suspension surgery that resulted in a profound uterine prolapse. I was fortunate. I refused further surgery and was blessed to have solved the prolapse problem, which has benefitted thousands of women all over the world. the same dynamics that cause urinary incontinence often lead to pelvic organ prolapse as well. According to the Agency for Healthcare Research and Quality, about 25% to 45% of women suffer from urinary incontinence, defined as leakage at least once in the past year. 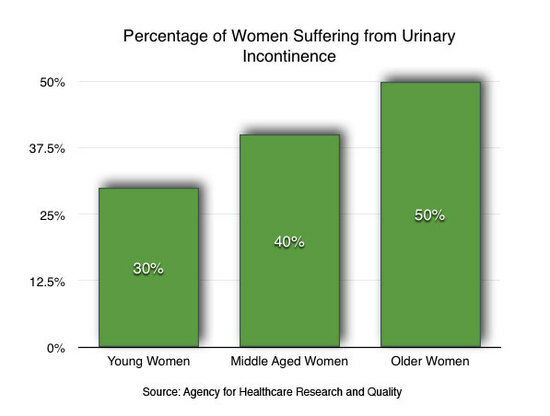 The rates of urinary incontinence seem to increase with age: 20%-30% of young women, 30%-40% of middle-aged women, and up to 50% of older women suffer from urinary incontinence. That’s 50 million women in the US alone. Bear in mind these statistics do not reflect the millions of women whose urinary continence systems have been compromised by hysterectomy and other pelvic surgeries. Regardless, it is a problem that has a big negative impact in the lives of women. You may be one of them, or know women who struggle with urinary incontinence. In its original health, the lower urinary tract is astonishingly complex and effective, working tirelessly day and night to store and void urine. But for many modern women, it becomes less effective over time. As is usually the case for chronic conditions, the medical system treats incontinence as a disease to be dealt with using their normal array of weapons: drugs and surgery. The drugs are notorious for their awful side effects, and the surgeries are highly dangerous, often leaving women much worse off than they were before the operation. For those of you who know me through my work with pelvic organ prolapse, you know that my view of the female body and its chronic conditions differs strongly from that of the medical system. For those of you who don’t know me and the Whole Woman work, my breakthrough research on non-surgical control of pelvic organ prolapse has kept thousands of women out of the operating room in over 60 countries. I am the author of Saving the Whole Woman, the definitive book on the subject, as well as Save Your Hips, and I have produced eighteen videos and video courses. My online forum has over 11,000 members, virtually all women with prolapse and incontinence. I have also trained and certified Whole Woman Practitioners in the US, France, Canada, the UK, and Australia. Chronic conditions like prolapse, chronic hip pain, and incontinence are not diseases. They are symptoms. As such, they are your body’s way of talking to you, telling you what is wrong. When you listen to your body and make appropriate changes, the symptoms stabilize, improve, and often disappear. For incontinence I have developed a four-part strategy for restoring urinary continence and eliminating the embarrassment and inconvenience of losing urine, not to mention the expense of absorbent pads and diapers. We all carry a burden of environmental toxins to which we have been exposed since childhood. These include heavy metals, and pesticides used on conventionally raised farm crops and carried into our water and air. Drugs administered to farm animals that are transmitted to us through their milk and flesh, and drugs we have taken for various ailments throughout our lives also add to our toxic burden. Additionally, we have been exposed to industrial pollution from petrochemicals, fossil and nuclear power generation, and toxic chemicals found in manufactured products we use. All of these toxins stress the body, causing the release of cortisol, which over time weakens our connective tissue. Fortunately, there is much we can do to flush toxins from our system and help restore health to the tissues that support our bladder and urethra. Detoxify and repair are actually two sides of the same coin. One of the many miracles of the human body is its astonishing capacity to restore itself when given the proper conditions to do so. When we find ourselves with a chronic condition like urinary incontinence, we are conditioned to assume the role of patient: passive, “patiently” waiting for some authority to help us recover. You are not the patient. You are the physician. No one knows your body better than you do. No one can be sensitive to its changes like you can. No one can successfully manage your condition but you, whether it’s prolapse, incontinence, hip pain or a variety of other chronic ailments. Unfortunately, we humans are amazingly addicted to our unhealthy habits. Our propensity is to run to our doctors when something goes wrong and demand that he or she fix the problem. Is it any wonder that the medical system specializes in making symptoms disappear, rather than creating underlying health, which no one can create but you? Good health is not something that happens to you. The good news is that health is relatively cheap. It just takes some education and effort. Disease is expensive. Let me share some information with you that I have gleaned from the latest research on the micro and macro biology of the female continence system. Regaining control of your body and your life requires you to be proactive. Detoxifying and repairing bladder tissues means scrutinizing your diet and likely making a few changes. And detoxifying isn’t something you do once or twice a year as with a so-called “liver cleanse”. It is what you do each day to reduce the toxic load we all carry. It turns out that proper pelvic alignment not only is the path to resolution of prolapse and chronic hip pain, it also plays the essential role in regaining control of your continence system so your urine stays where it belongs until the proper time and place to release it. Additionally, there is a highly specific form of strengthening that must be done to restore function of the muscles and ligaments responsible for your continence. And this has nothing to do with Kegel exercises. And, as I have proven with thousands of women who are successfully managing their prolapse, you can regain control of your bladder and avoid dangerous drugs and surgeries. Like so many chronic conditions, incontinence can be stabilized and reversed over time. And it doesn’t take much time with these completely new and revolutionary techniques. Urinary incontinence is related to prolapse, and a condition that plagues millions of women around the world. If you have bouts of incontinence, such as leakage when you cough, sneeze, laugh or run, you have stress urinary incontinence, or SUI. If you find yourself racing for the bathroom unexpectedly, losing urinary control in your sleep, or prone to frequent urge to urinate, you have over-active bladder, or OAB symptoms. While not life threatening, incontinence is definitely quality of life threatening. Regaining control of this function is increasingly important as we get older. If incontinence is restricting our activities, we run the risk of physical, emotional and mental decline. You can regain control of your body and your life, but you will have to do three things to accomplish this. First, you need education to understand what is really going on with your anatomy. Sure, you can put yourself in the hands of a doctor and hope that he/she will use their expertise to do the right thing by you, and avoid the work of educating yourself. But you and your doctor have a conflict of interest. He or she wants to do surgery, because that’s where the money is. Sad but true. Secondly, you need support. You will have questions, concerns, uncertainties. At Whole Woman we understand this and provide our online forum at no cost, have our network of Whole Woman Practitioners, and of course I continue to work with women over the phone, Skype, and in-person. So the support infrastructure is there in place for you. Finally, you have to be prepared to experiment and change your behavior. If you think about incontinence as your body’s cry for help, you will realize that it is time to start listening and adapting your behavior and learning how your body responds. Human beings are like trains. We get set on a track, doing what we have always done in the past, and then wondering why conditions in our lives don’t improve. Creating health requires reassessment of your eating, exercise, and postural habits. You need to be willing to change tracks. Sometimes that means letting go of cherished foods or traditions. But your body will tell you if you are on the right track. If you are a married or partnered woman, it's even more challenging to make these kinds of changes because they impact the life of your partner. For the married or partnered woman, changing your diet and lifestyle is a team effort. You need to work on this together. Even if that means confronting the awkwardness of revealing the existence of your incontinence for the first time to your spouse or partner. In my experience, when you face these kinds of challenges together, you divide and share the load. Not only does this make the work easier for you, it creates a powerful bond in the relationship. But once you have learned the root causes of your incontinence, mastered Whole Woman posture, and my specialized exercise program for incontinence, you will be well on your way to regaining and maintaining control. Just freedom to laugh, cry, sneeze, run, jump, and fully enjoy this blessed (if sometimes challenging) life! I've also included my video, All One - The Bacteria-Gut Partnership. Because diet has such an impact on overall health, including urinary incontinence, you will find this video eye-opening. I have pulled together the latest research on diet and gut health that cuts through much of the noise in the popular press about paleo, gluten-free, and other diets. You have 60 days to watch and apply the course teachings. If you are not satisfied with the course, just call or write our office and we’ll refund the cost of the course. And you can keep the bonus video(s) as a thank you for trying the course.